What Is Achiote and How Is It Used? Achiote and annatto are used interchangeably. While it's often employed to give a dish a yellow color, it also has a mild peppery flavor. Whether it is as whole seeds or a ground spice, achiote paste, or achiote oil, you'll come across this ingredient quite often when exploring Mexican or Caribbean cuisine. Achiote is a spice and coloring agent extracted from the seeds of the evergreen Bixa orellana shrub. After macerating in water, the pulp surrounding the seeds is made into cakes for further processing into dyes. The seeds are dried and used whole or ground as a culinary spice. Commercially, achiote is used to add yellow color to chorizo, butter and margarine, cheese, and smoked fish. Achiote is native to the tropical areas of the Americas, including the Caribbean and Mexico. The Spanish brought the small tree from the Americas to Southeast Asia in the 1600s, where it is now a common food ingredient. It’s also produced in India and West Africa. Achiote is used in Mexico and in the Aztec language of Nahuatl, as well as Spanish-speaking countries of the Caribbean. Annato is common on some Caribbean islands and in areas of South America. Roucou is used frequently in Trinidad and Tobago, Martinique, and Guadalupe. Achuete is primarily used in the Philippines. Urucul Is the name of the spice among the Tupi-Gurani Indians of the Amazon. When used in small amounts, primarily as a food colorant, achiote has no discernable flavor. When used in larger amounts to add flavor, it imparts an earthy, peppery flavor with a hint of bitterness. Achiote seeds give off a slightly floral or peppermint scent. Achiote powder mixed with other spices and herbs can be turned into an achiote paste to marinate and give a smoky flavor to meats, fish, and poultry. A popular product made with ground achiote is sázon, available in small foil packets and ready to use in your recipe. Most sázon brands contain MSG, but Badia does not. Achiote seeds are steeped in cooking oil to make achiote oil or lard for achiotina, infusing them with color and flavor. Sautéing in or cooking with the oil or lard adds color to rice, paella, meat, soup, stew, fish, and some yuca dishes. On the Spanish-speaking Caribbean islands, achiote used to make yellow rice and sometimes added to sofrito. In the French Caribbean, it’s used to make a fish or pork stew with berries and lime known as blaff. Achiote is used as a culinary spice, food colorant, and commercial dye. Caribbean natives were adding achiote to their dishes for flavor and color long before Europeans arrived. They also used it in cosmetics, as a fabric dye, body paint, sunscreen, and insect repellent. Some historians theorize that the term "red-skins" comes from the use of achiote as body paint because it is a natural dye that turns the skin a reddish color. Also, it's believed that the Aztecs added the seeds to a chocolate drink to enhance its color. Achiote is sold several ways: ground, as seeds, as a paste, or infused in cooking oil or lard. Look for it in the spice or ethnic food aisle of your grocer. Packing includes bottles, bags, or vacuum-sealed bricks. Ground or powdered achiote is often mixed with other herbs, spices, and even cornstarch. Be sure to read the label if you have any food allergies. Buy brightly colored red-orange seeds and avoid dull or brown seeds as they are past their prime. These are too old and have lost their flavor. Both seeds and ground achiote will keep for a long time. With proper storage, achiote can be good for up to three years. Store it in an airtight glass container and a dark cabinet away from the light. Achiote oil or achiotina will keep a few months when stored in a glass jar in the refrigerator. Annatto extract from achiote is used as a natural alternative to synthetic food colorings. 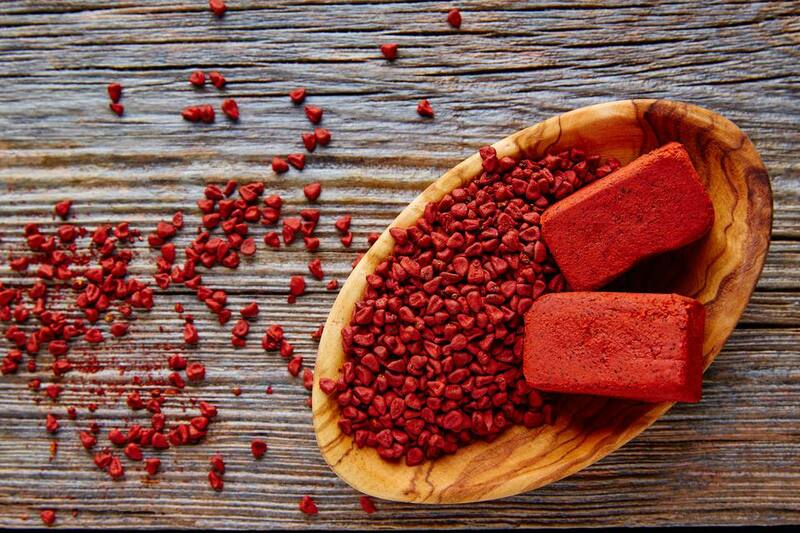 Ground achiote seeds have 3 percent of the daily value for iron per teaspoon. Achiote seed powder has been studied to see if it might have enough antioxidant and antimicrobial activity to extend the shelf life of meat products, with some promising results.